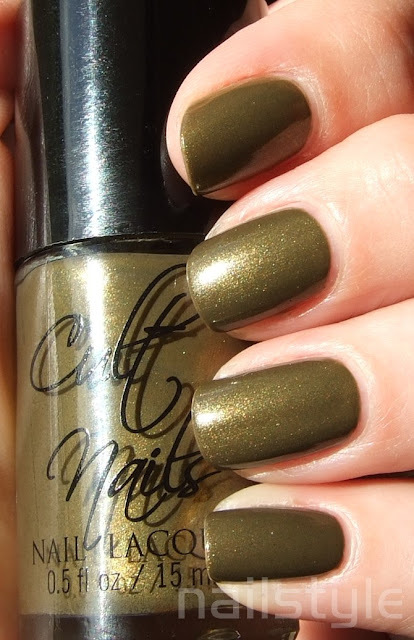 Todays mani is another polish from my Cult Nails haul. This is In a Trance - a gorgeous olive green, gold based shimmer. I absolutely love this vintage gold and it applies beautifully. This is three coats and topped with Essie Good to Go. And just because I can't seem to leave well enough alone I thought I'd attempt to embellish it a bit. I wish I'd left it alone because it looks amazing on its own. Nevertheless this is In a Trance stamped . . .
First I really love this color! Second, I never thought to stamp at the base of the nail! Haven't seen that before. Very very cool! This looks awesome! I love In A Trance! I love this colour too! Thanks for commenting.